Please buy the manga when it's out next year!!! It seems to be a brand new school term as the girls were dressed in summer uniforms. Just then, a new character arrived with style via bike, attracting the attentions of the fangirls around. Akiho greeted Chika as they met but Chika seemed a little sadden, so Akiho teased Chika by apologizing for not being Haruna lol. Chika changed the subject by pointing them to the crowd swarming the new character. The new character amused by the mob, asked if they could bring her to the school office, sending the fangirls into a frenzy and knocked over the bike. Akiho noticed the bike falling and rushed over to hold it, along with the new character. The new character then asked Akiho to bring her to the school office, to the disappointment of the fangirls. The new character smiled and sent the fangirls into a frenzy once again by winking at the fangirls. 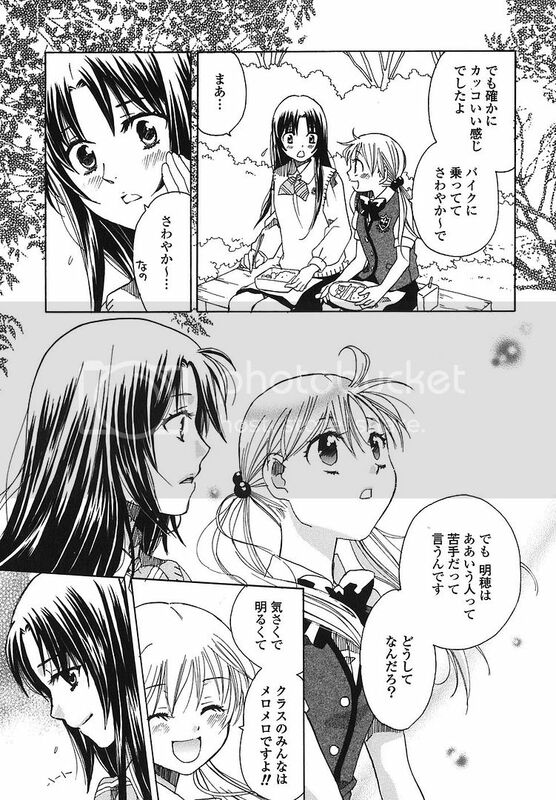 As Akiho and Chika brought the new character to the school office, Akiho asked if the new character's the new relief teacher. The new character teased Akiho by stating that she's curious in her hm? Akiho agitatedly yelled that it's natural isn't it, if not the new character would not be allowed in school grounds, thus making the new character chuckle at Akiho's reaction. The new character moved her attention on the unsuspecting Chika, calling her cute and naive. Feeling a little pissed, Akiho walked off with Chika and told the new character to make her way to the school office which was around the corner herself as they had to go prepare for their classes. Chika wondered at Akiho's sudden actions which Akiho merely replied that she had an annoying feeling and didn't want to listen to a person as the new character talk lol. Akiho then advised Chika to be more cautious but Chika said that the new character's all smiles and friendly, looked to be a good person and added, cool too. Akiho apparently doesn't think so lol. Chika's surprised as it was quite rare that Akiho would comment that badly on a person. Akiho replied that a person like that new character's difficult to deal with lol. During lesson, the new character was introduced as their new relief English teacher, Hiiragi Touko-sensei lol. The girls in classes instantly began fangirls while Akiho and Chika were like, 'Ah! That person from that morning!' [Akiho called Touko as cheater though lol]. Chiori immediately stood up and reprimanded the girls for being rude, creating a din as the other girls commented that Chiori's bullying people again. Touko-sensei managed to stop the noise by making this pitiful? worrisome? looking expression wishing the cute girls will get along with each other, to which the fangirls with hearts in their eyes gladly listened. During lunch, Chika told Haruna about the new teacher, Touko-sensei, however Haruna said that she already knew about her, rumours spread fast about cool teachers lol. Chika too agreed, wondering why Akiho would say Touko-sensei to be a difficult person to deal with because she seemed to be a friendly and straight-forward person. Haruna listened with a grim expression on her face. Chika suddenly changed the topic by complaining to Haruna that she felt lonely that she didn't see Haruna that morning and she had wanted Haruna to be the first person to see her in summer uniform lol. Haruna grasped Chika's hands, apologized as she had duties that morning and went on to comment Chika looked cute in her summer uniform. Chika blushed and thank Haruna for the praise. In her mind, Chika told herself that even though Touko-sensei had called her 'cute' earlier, compared to Haruna calling her 'cute', this made her feel like she was bursting with joy. Although they had been through alot since they first met, to be able to enjoy sweet moments with Haruna in their secret garden, brought her the most happiness. 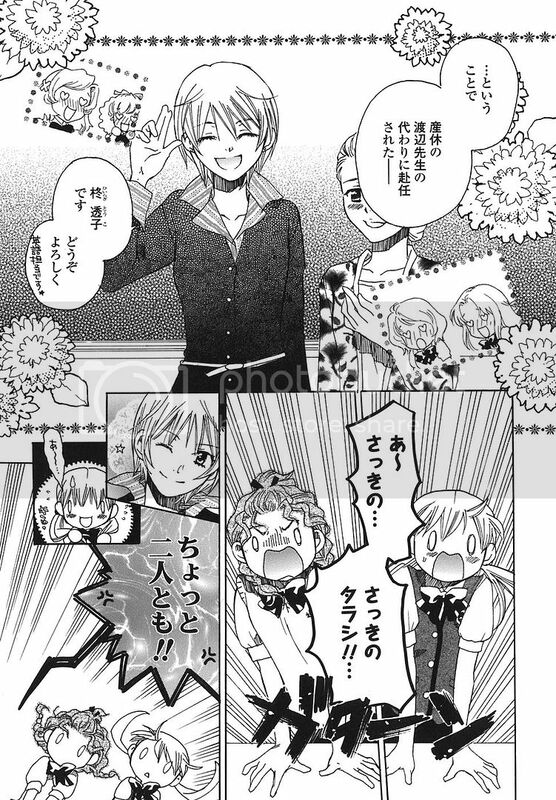 As they were walking down the stairs, they noticed Touko-sensei in the centre of attention in the crowd like an idol. Suddenly, Chika missed a step and fell down the stairs, spraining her ankle. Touko-sensei noticed the commotion and went over to help by carrying Chika bridal-style to the infirmary. 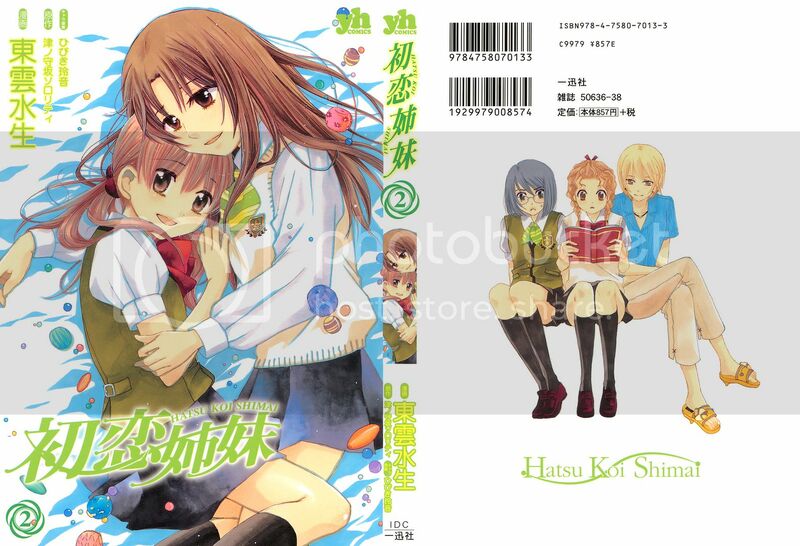 Haruna could only looked worriedly at Touko-sensei carried Chika there. Chika felt like a princess and very embarrassed being like that but later relaxed by Touko-sensei's soothing warmth. In the infirmary, Touko-sensei help bandaged Chika's ankle as the teacher in charge wasn't around. Haruna, with a worried expression on her face asked if Chika's alright. Not wanting to see that expression on Haruna's face, Chika bolted up on her two feet while trying to control her pain lol. 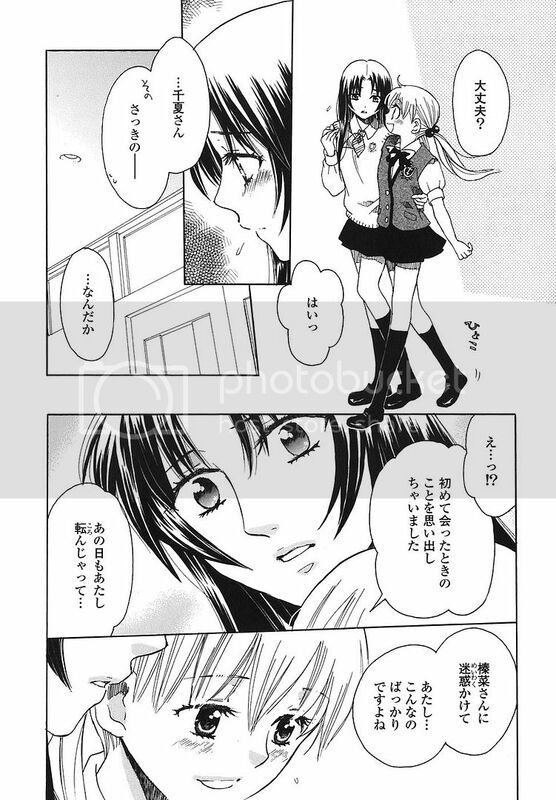 Haruna then offered to assist Chika back to her classroom. As they were walking back, Haruna tried to explain probably her helplessness just now, but Chika said that the incident reminded her of the first time she met Haruna. Chika continued that she had fallen that day too and clumsy her brought much troubles to Haruna. However, Chika added, because of that day, she had met Haruna and be with her now. 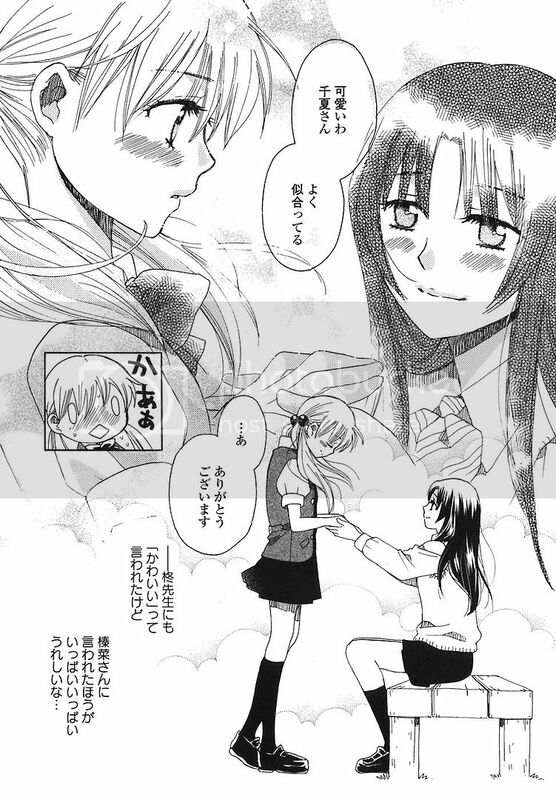 Haruna felt touched by Chika's words, smiled and agreed. Unknown to them, Touko-sensei heard their conversation and seemed to conclude something. After school, Chika felt agonized by the glares of Touko-sensei's fangirls lol. Touko-sensei made matters worse by coming over to offer Chika a lift home lol because it was her fault that she's too mesmerizing that Chika fell. Akiho then went to Haruna's classroom and told her that Chika went home already, no thanks for Touko-sensei. 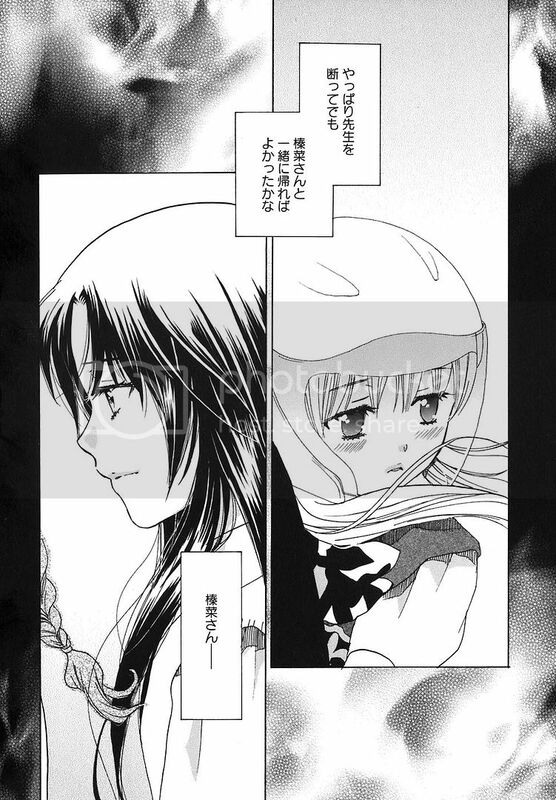 Akiho angrily added that Chika had wanted to walk home with Haruna but was forced away by Touko-sensei. Haruna smiled and remarked that it's rare to see Akiho so worked up lol. Akiho blushed and stammered that she's not angry, just that Touko-sensei's a difficult person to deal with and seemed to be a liar. Haruna didn't mention more and suggested that they go home then. Hm, seemed like I was off when I stated that Akiho likes Chika romantically in Chapter 5. After this chapter and ... lol okay I was spoilt by the next 3 chapters that Akiho likes Chika only as a friend and likes Haruna alot haha. And no, Touko-sensei's not a bad person, she's just probably more realistic and trying to speed things up between Chika and Haruna which is good isn't it? Ahhhh, no more spoilers, await Chapter 7! 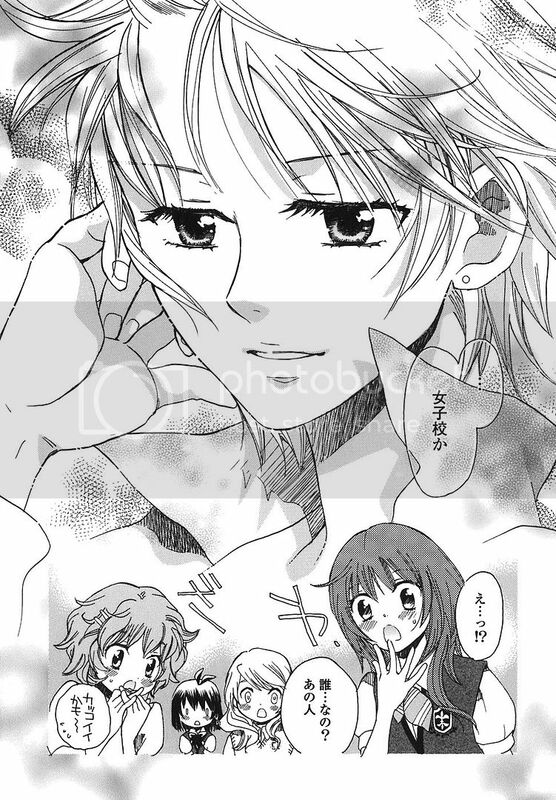 Oh I'll be posting up the summary for Yuri Hime S #2, Honey Crush Chapter 2 this saturday! I finally watched 'Blue Drop Tenshi-tachi no Gikyoku' today and ... I found Wakatake Mari's voice very familiar and it turns out that the seiyuu for Mari is the same as the seiyuu for Nohara Shinnosuke in Crayon Shin-chan LOL. I was constantly reminded of his witty lines in Mandarin [I watched the anime on VCDs in Mandarin], '呵呵，我没那么好啦!' and his '我是野原新之助，今年五岁!' pick-up lines lol. I also watched Minami-ke a few days ago, I skimmed through the manga first before watching the anime and episode 1 was totally hilarious lol. 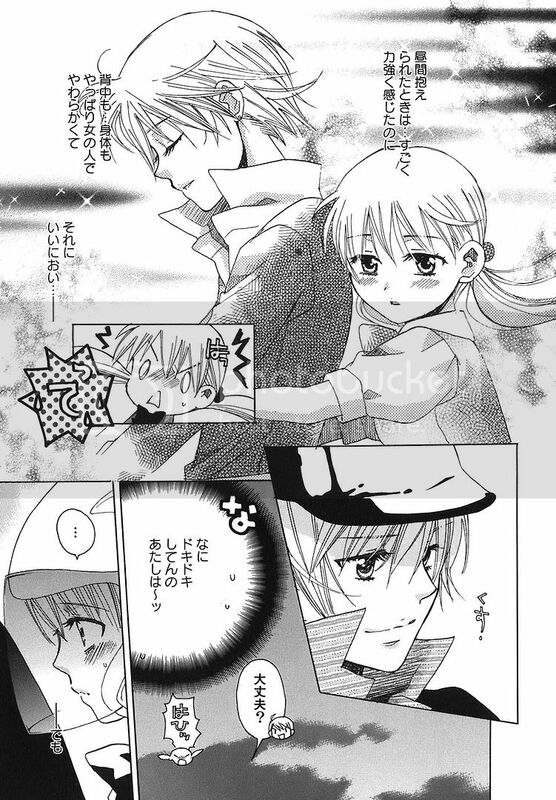 Especially the scene where Kana-chan tried to kiss Chiaki-chan and chased her around when she refused. I love episode 5 too, when Kana tied and hanged Chiaki to the pole and treated her as the Weather Doll LOL and later prayed at Chiaki, that was totally priceless! Okay, it got me interested cos of Mako-chan lol, the potential successor to the Best Trap Ever, Miyanokouji Mizuho hahahaha. Seriously, Haruka's really dense -.-||| but BURNINhotcute nevertheless. Hmm, HQ's and S's birthday parties fell on the same day [which is this coming saturday], so I had to make two trips since both of them came to my party, so it's polite to go to theirs. Not sure what to get for them, probably ... heh, I dunno lol. Oh yeah, I'm going to Genting Highlands next Monday~~ Miss the KFC and Pizza Hut there, yum and won't forget to scream 'I LOVE KFC' when on the Dragon ride lol. OMG thx you for this chapter that was so kool omg cant wait. and YESS!! FINALLY UR GONNA put up Yuri Hime S #2 Honey Crush Chapter 2 this saturday! yeah!! ty! !